Oprah you ambushed Debbie Jones Ministries; you used your name to play the church and media like puppets on a string. Everyone fighting, fussing, squabbling over what Ms. Oprah proposed for Debbie Jones Ministries. The deception was absolutely tragic. God used me as a prey to expose your raunchy ~ perverse and crooked ways. Now Ms. Winfrey you will experience the boomerang effect…….. The Holy Spirit expressed concerning you “what lies she’s up to.” God is interrupting your carefully prepared lies. The Holy Spirit said that for 45 years God asked you, Oprah Winfrey, to take office with Him. ~ You Didn’t. You burned fire illegally to your god and you rationalized away your salvation, desiring this power over your name being written in the lamb’s book of life; you’ve become the devil’s slave. Mess with (that strange) fire you get burned!!!! Oprah Winfrey, you signed a contract by the fire….by the elements…..with the devil and he has gotten your tongue. You sold your soul to the devil. You alluded on the World Wide Internet that God is Jealous of you. You really do let your hair down in the back of the studios, don’t you? As I watched you on the internet (last year), I mentioned to my sister that you actually looked like a spirit had taken you over. We both agreed your eyes looked like that of an Out of Space Martian. You are very strategic; you wouldn’t dare do that on National T.V. You denied Jesus Christ; the Lord of Lords; the King of Kings. There are several paths to god(s); however, there is only one way to “The God” above all other gods; that way is only through Jesus Christ. Go ahead serve your god, whether it be the god of Hinduism, Buddha, Muslim, etc., But America is my country, the pilgrims came here so that they could have freedom of religion; our forefathers granted me and every citizen in this nation the honor and privilege of serving whomsoever we desire, and I choose to serve Jesus Christ. There are many others who have chosen to serve Jesus Christ as well. Oprah, you missed your opportunity; you sold your soul to the devil and now you hate Jesus; you’re trying to introduce your corrupt idols to the world…..and to our children. You are introducing our children to your god(s), because you missed your time of visitation with Jesus Christ. You are the devil! You have stolen; you have killed to acquire all of the material and comfort in the world. But your high places are coming down. As sure as you have stolen, robbed from individuals, someone is robbing you. Go check your papers! You Are Zero! You’ve been faithful burning your fire to your god (Satan)! And just as he offered the world to Jesus and Jesus said no to the devil, he offered it to you; you gained the world but your soul is lost! And still, at the end, when witchcraft has run its course, You Are Zero…..Broke down ~ Poor and Wretched! How miserable you must be. The Holy Spirit disclosed that you have killed so many people (with your words and brew of elements) behind closed doors! I don’t want to serve your god who grants you an abundance of material blessings, but when you pray to him tragedy/death follows. You are like your father Satan, the great deceiver. God used me as a prey to expose you as well as the Son of Perdition. The Holy Spirit said that at the very beginning, you had absolutely no intentions of doing those things you promised for Debbie Jones Ministries. And you should have never gotten involved (“Esther” Movie Ordeal). He disclosed that you are like Hitler, running the world from your throne, trying to control who comes up and who goes down. So at the very beginning you made a pack with TBN to cut a deal with me; but behind closed doors, you stirred your magic to cause havoc. You disgorged your spell and yes, you slew my mother. You killed my mother, Ruby Jones, behind closed doors. As soon as you got involved, my mother died. ~ Now the Holy Spirit exposed that! ~ God allowed the defiled manner in which she passed to illustrate your witchcraft. Ruby Jones was a sacrifice to demonstrate your demonic powers. Nevertheless, He said that it was her time to go! The battle that was ahead of me her heart could not have endured. Again, when you pray to your gods, tragedy…..death follows. You have rationalized in your mind that your good nevertheless outweighs the bad. Your objective outweighs the sting of death. You prayed to your gods over Jamie Fox; miraculously, he won the Oscars, but he paid a price, his beloved grandmother died. You alluded in your magazine that Jamie’s grandmother was in heaven helping him to win the Oscars. True, our loved ones who have departed (whom you’ve killed) are busy in the heavens; nevertheless, this is your way of rationalizing away your guilt for their sudden and unexpected death. When you do your work, it slays the elderly. God was angry with America for turning away from Him so He put America in your hands…the hands which illegally worship the gods of this world. You show no mercy……..“upon the ancient hast thou very heavily laid thy yoke”. When you pray to your gods, the answer manifests at the cost of the ancient (elderly) dying. You personally know that when you cast your spell, whether to impart a gift or to curse, someone will die. [Isaiah 47:6] When an anointed Priest of Almighty God intercedes, blessings and peace follow, not tragedy. The blessings of the Lord maketh it rich and add no sorrow with it. But tragedy, distress and mourning follow your powers. You prayed to your gods over Jennifer Hudson; her tragic loss was not accidental, it followed your prayer to the god of this world. Jennifer’s heartrending loss had all of the rudiments of witchcraft the Holy Spirit cautioned me about over the years, inclusive of kidnapping. The Holy Spirit confirmed that it was your tampering with the elements that caused Jennifer’s terrible loss prior to the event unfolding before the world the following morning. The Holy Spirit particularly instructed me to warn Jennifer Hudson: You need to come out from under Oprah Winfrey’s covering! Jennifer, are you still getting married? The Holy Spirit brought your fiancé to my attention. She has not jinxed your relationship has she??????? Oh yes, the Holy Spirit particularly pointed out that you, Oprah Winfrey, Bewitch Ms. Coretta Scott King and the condominium that you purchased and then showed up at her funeral. You treacherous son of a gun! Oprah, you supported and prayed to your gods concerning President Barak Obama also, and He won the Presidency, but his beloved grandmother died. God has a way of using the devil to work out His Divine Plan. Oprah, you want to run the world and create policies to destroy my country….our country. That is what the Holy Spirit said. The Spirits of Our Founding Fathers are turning over in their graves…. It will not work! Christianity will return strong, over the television waves! And President Barak Obama will not be your puppet! God has the Antidote. And to all those who read this special note concerning President Barak Obama, don’t be alarmed. He is not the First (nor will he be the last) President to have a witch supporting and brewing over his Presidential candidature. Remember, the Holy Spirit disclosed that witchcraft is definitely rampant within our government! This is one reason why so many of our elective officials are falling from grace into sexual immorality. (Government officials, if you are not walking circumspectly, your best marriages can and will fail.) Under the conditions, the Holy Spirit disclosed that President Barak Obama is doing a good job, disclosing again, God has the Antidote. Fellow citizens of America, we need to pray for President Barak Obama. Finally, Oprah, I found it interesting that one of your guests, the ice skater, Tonya Hardin, stated this year 2009 that when you made contact with her about coming on your show, her father died that very same day. That was eerie for me (under the circumstances) to hear her say that over national television. She felt that it was an honor to be on your show, but actually it was a curse…….. 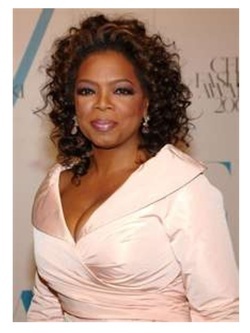 The wind of tragedy and death follows you, Oprah. I wonder about all of the other untold (so called coincidental, by chance, and accidental) stories of death that follow those you have encountered. Warning to all couples, comparable to Creflo Dollar of World Changer’s International Church, whom the Holy Spirit recently disclosed his ministry is a C-U-L-T, Oprah Winfrey plays match maker and breaks up couples. Hollywood, she has been smiling in your face, gorging intimate secrets; then she goes behind your back casting spells to cause you to split. Thus, where disharmony and arguments exist between some celebrity couples, this has come as a result of Ms. Oprah Winfrey praying to her god(s); Yes, Oprah determines if and when there should be a Hollywood Breakup; she burns her fire to her god(s). Cover and protect your marriages. The lesson that must be learned is: keep your mouth shut concerning your private affairs…you may be disclosing information to a witch. 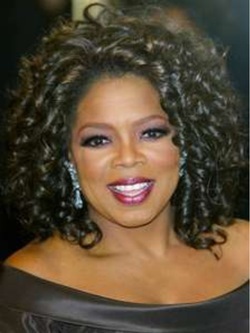 Ms Oprah Winfrey, the Holy Spirit disclosed my experience with you is very much compared to the Wizard of Oz. However, you are not a neighborhood witch; you are a powerful national witch. Again you offered your gift, with evil intent. I got taken up in a cyclone. No wonder things went spiraling down……. I am a living sacrifice to the world to demonstrate witchcraft. The Holy Spirit disclosed the years, in which my name has been public, were to intentionally demonstrate the power of witchcraft….. Oprah, it is your turn. You will spiral down to nothing. God has been very careful in tearing down your high places, realizing millions are watching. You see He loves His people and He is a God of Order, unlike your god, the devil, who is the god of chaos and confusion. That’s what you and your name caused at the initiation of the movement; and that is why God disclosed at the beginning that Witchcraft was not going to knock this movement out. God must have gotten your attention with that note; you were so confident about stealing my goods, because you had successfully and inconspicuously knocked several other businesses down over the years. Nevertheless, God has the antidote! And the antidote is the boomerang effect and the sevenfold return principal. What God started, He will finish. Yes, the enemy must return stolen property sevenfold…… Since my story is likened to the Wizard of Oz, it is not over until the wicked witch is dead. God is very strategic, -- the witch is coming down!